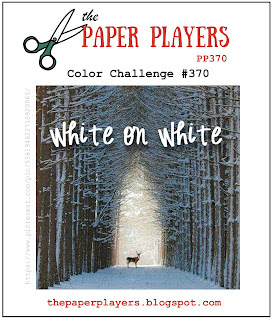 I have always admired cards with a white on white color scheme and have been wanting to give it a try so this week I combined these two challenges to create this card. The first layer has craft foam behind it to give dimension. 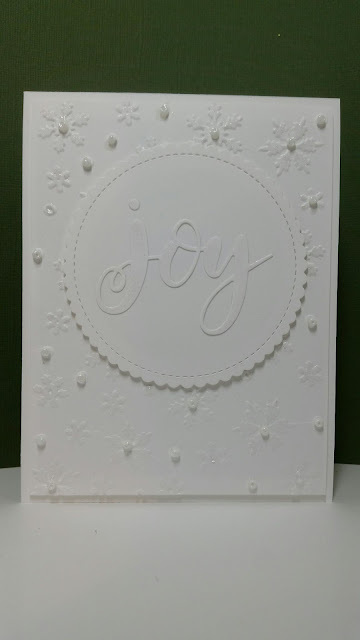 I embossed it with a snowflake folder by Darice. The next layer is also popped up with craft foam to add another slight shadow in the white on white colors. I diecut the word Joy and adhered it to the stitched mini scallop circle. 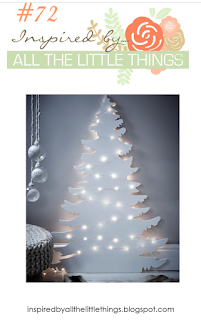 Each snowflake has glitter added with the wink of stella pen and tiny pearl beads have been added throughout the snowflakes. It turned out very pretty and I was happy with the end result. Hope you'll join us in these fun challenges. It is definitely helpful in encouraging me to try new things. Oh my, this is lovely! The snowflakes are the perfect addition and I love how you've distinguished them with sparkle and pearls. Can't go wrong there! Thank you for joining us at The Paper Players! The pearl beads add so much interest! Thanks for playing with us at Inspired By!